Thanksgiving tickets: Moviegoing has become such a big part of Thanksgiving in recent years that it really belongs on the menu. A post-Thanksgiving dinner visit to a nearby multiplex is for many people as routine as binging on turkey and pumpkin pie. In fact, movie ticket sales will be part of the festivities not just on Turkey Day, itself, but over the long five day holiday period stretching from Wed., Nov. 25 through Sun., Nov. 29. Hollywood will make the most of how moviegoing expands over Thanksgiving by launching four wide releases that should play best to very different core audiences – "The Good Dinosaur"(3D animation for families), "Creed"(a boxing drama for adult men), "Victor Frankenstein"(a sci-fi horror tale for young men) and "Suffragette"(an awards contender drama for adult women). Also competing for moviegoers' time and money will be three holdover blockbusters -- "The Hunger Games: Mockingjay – Part 2,"which opened last weekend to a chart-topping $101 million (plus another $146 million from opening in 87 international territories);"Spectre,"which placed second with $14.6 million and a three week domestic cume of $153.7 million; and"The Peanuts Movie,"which finished third with $12.8 million and a three week domestic cume of $98.9million. The PG rated 3D animated comedy adventure "The Good Dinosaur," opening Nov. 25 at about 3,600 theatres from Pixar Animation Studios and Walt Disney Pictures, is from the creators of "Inside Out. "It should be a prime destination Thanksgiving weekend for families with young children. And it figures that moms-with-kids will keep turning out in the coming weeks to catch up with it or see it again. Directed by first time feature director Peter Sohn, whose credits as an animator include "The Incredibles" and "Ratatouille," its voice talents include Jeffrey Wright, Frances McDormand and Raymond Ochoa. "Dinosaur"imagines what would have happened if the huge asteroid that hit Earth hadmissed it instead and, therefore, didn't wipe out the dinosaurs. Its story centers onArlo (voiced by Ochoa), an Apatosauruswho makes an unlikely friend in Spot, a human boy (voiced by Jack Bright). It's only after Arlo learns the power of confronting his fears, that he discovers his true capabilities. "'The Good Dinosaur' is one of the most emotional movies we've ever made, observes executive producer John Lasseter. "It's really funny and clever, and as the story unfolds, this deep emotion emerges. You fall in love with Spot right along with Arlo. Their bond is so interesting and unique -- so different from anything we've ever done. It's a very special movie." Making a film about dinosaurs required a lot of research by the filmmakers so they could bring them to life properly on screen. "We went to a lot of museums to look at bones and fossils," Sohnrecalls. "It was eye-opening how wide our lens would have to be to ever capture something so large." Production designer Harley Jessup explains how they added authenticity to Arlo and his family: "We created a life-size print-out of Arlo to help imagine his gigantic scale. Arlo is 18 feet tall and weighs about 6 tons, and Poppa (Arlo's father, voiced by Wright), at 46 feet, is taller than the main building at Pixar. We exaggerated the size of the T-Rexes for our story, and they range from 38 to 50 feet tall, with Butch (voiced by Sam Elliott) weighing in at about 45 tons." Weighing in takes on an entirely different meaning in Warner Bros., New Line Cinema and MGM's PG-13 rated boxing drama "Creed,"opening Nov. 25 at about 3,350 theatres. Directed by Ryan Coogler ("Fruitvale Station"), it stars Michael B. Jordan and Sylvester Stallone and should play best to adult men. In "Creed," Stallone plays former World Heavyweight Champion Rocky Balboa, who trained and mentored Adonis Johnson (Jordan). Johnson's late father, Apollo Creed, was Rocky's friend and former rival. Looking back, Stallone is no stranger to turkey stuffed moviegoers thanks to some of his early hits – including,"Rocky," which opened Nov. 21, 1976 and pretty much launched Thanksgiving as a major moviegoing holiday weekend;"First Blood," which opened Oct. 22, 1982, but was still going strong for Thanksgiving, establishing what turned intothe "Rambo" franchise;"Rocky IV,"which opened Nov. 27, 1985; and "Rocky V,"which opened Nov. 16, 1990. "I grew up watching 'Rocky' movies with my dad; it was our thing," Cooglersays. "Rocky is a character that people just connect with -- action fans, drama fans, hopeless romantics, even just movie fans -- everyone likes 'Rocky' movies because they have something for everyone." Stallone, who's also a producer on the new film, has played the legendary role in six "Rocky" films over nearly four decades. "The impression Rocky has left on people is both confounding and extraordinary to me," he notes. "I've always felt a relentless responsibility to keep the character intact because of that. So when Ryan came to me with the idea of Adonis Creed coming into the picture, I thought it was incredible -- this filmmaker who is so young and yet so captivated by what we'd begun all those years ago. I admit, I was intrigued." Coogler, recalling his first meeting with Stallone, points out: "I could tell he was a little apprehensive. I hadn't even made a feature film yet, so he was probably thinking, 'Who is this kid coming in talking about making a 'Rocky' movie?' But I could tell he was also thinking about every different way it could work." Another Thanksgiving arrival with roots in a classic movie franchise is 20th Century Fox and Davis Entertainment's PG-13 rated sci-fi horror drama "Victor Frankenstein,"opening Nov. 25 at about 2,700 theatres. Directed by Paul McGuigan ("Wicker Park"), it stars Daniel Radcliffe, James McAvoy and Jessica Brown and should play best to young adult men. 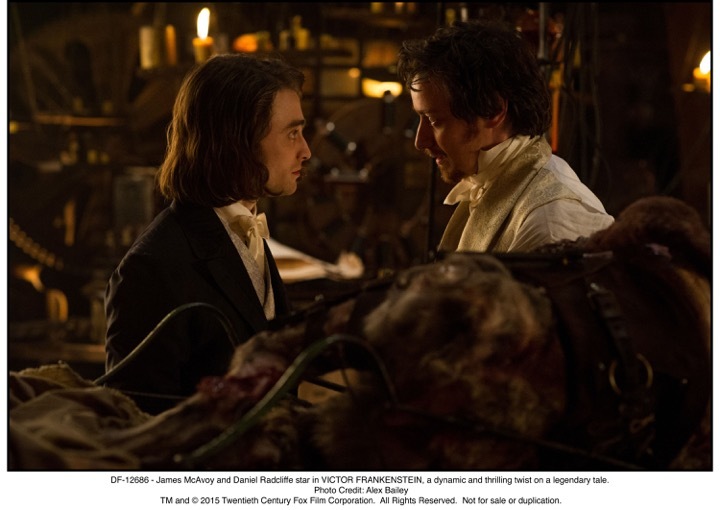 In this new take on the familiar story, radical scientist Victor Frankenstein (McAvoy) and his equally brilliant protégé, Igor Strausman (Radcliffe),want to help humanity through their groundbreaking research into immortality. Victor's experiments go too far with horrifying consequences and Igor must bring his friend back from the brink of madness. "VF" is the first version of the classic tale to be told largely from Igor's perspective. "It's a love story between these two men, really," notes McGuigan. "Victor and Igor need each other; in fact, Victor needs Igor probably more than Igor needs Victor in his life." Although the film is set in 1860, at the dawn of the Industrial Revolution, it has a contemporary sensibility. "I don't think of it as a period film," Radcliffe says, "but as being completely modern. Victor and Igor have cutting-edge ideas; they're the tip of the spear. They view science as being more than just observational. They believe it could be creative and re-shape the world.I like the film's irreverent tone and how it avoids being Victorian and buttoned-up. Victor and Igor are forward thinking." "These two young men are changing the world," adds McGuigan. "(Screenwriter) Max Landis has done nothing less than capture the zeitgeist of all the Frankenstein movies he's watched. He's cherry-picked ideas and created his own 'monster,' so to speak." McGuigan liked Landis' idea oftelling the story through Igor's eyes. Igor actually wasn't a character in Mary Shelley's novel and didn't appear in most of the subsequent Frankenstein movies. The hunchbacked lab assistantplayed by Dwight Frye in James Whale's 1931 classic "Frankenstein" is who people typicallythink of as Igor, although thecharacter's name was Fritz. Moviegoers also rememberIgor fromMel Brooks'1974 hit comedy "Young Frankenstein," but thatcharacter (played by Marty Feldman) insisted on being called Eye-gore. Thanksgiving weekend is also good timing for awards hopefuls to expand their runs so to reach adult moviegoers who have time to see a film over the holiday but want it to be something serious. Focus Features and Film4's PG-13 rated historical drama "Suffragette" is just such an Oscar contender that's been playing in limited release and is going widerfor Thanksgiving. Directed by Sarah Gavron ("Brick Lane"), it stars Carey Mulligan, Helena Bonham Carter, Brendan Gleeson, Anne-Marie Duff and Meryl Streep. It should play best to adult women. Mulligan, who's been generating a strong best actress Oscar buzz, was a best actress Oscar and Screen Actors Guild nominee in 2010 for "An Education." Streephas received 19 Oscar noms going back to 1979 and has won three times – for supporting actress in 1980 for "Kramer vs. Kramer," for best actress in 1983 for "Sophie's Choice" and in 2012 for best actress for "The Iron Lady." Given the fact that just about everything Streep does seems to resonatewith Academy members, she could wind up with anothersupporting actress nod for "Suffragette." The film's focus is on Britain'sfeminist movement pioneers in the early 20th Century, who were forced to go underground in their struggle against an increasingly brutal government. Radicalized and believingviolence was their only way to achieve change and win the right to vote, they riskedeverything to fight for equality. Bottom line:Hollywood looks forward to cleaning up at the boxoffice after Thanksgiving dinner.